Most of India was a British Colony till we attained Independence in 1947. Smaller portions were under other countries incl Pondicherry with France; Goa with Portugal; Cochin, portions of Chennai with Dutch etc. Colonial India was a very painful past of India! Before that India has fantastic trade connections across the world. But since 1496, since the arrival Portuguese with Vasco da Gama, situation totally changed! From business dealings, it got to ruling & colonizing and instead of buying, it became looting!!! Few tiny little places were Danish colonies incl Nicobar Islands, Calicut in Kerala, Serampore in Bengal, Balasore in Odisha, Patna in Bihar and Tharamgambadi in Tamil Nadu. By 1868, the Danish sold their Indian colonies to other Europeans, mostly to British!!! The Danish reached India at Thanjavur and its king Sri Raghunatha Nayak granted them with Tharangambadi to start with their trade forming Danish East India Company and the permission to build a fort here! Eventually they colonized few towns here! Today, like Pondicherry, this town too is also so unusual than rest of India which have a British influence! Here, the town planning and architecture have a very Danish influence! To begin with, there’s the Danish Fort aka Dansborg (remember Rosenborg and Christianborg? Yes, Borg means Fort in Danish) built in 1620! Its located bang opposite to Bungalow on the Beach! It is in 2 floors of which the lower floor was used as a storage place for food, liquor, arms & ammunition, poultry etc as well as the dorm for the soldiers as well! The upper floor was used as the living space for the governor and priests! Today the upper floor is used as the office and inhouse museum! All the storage areas in the lower floor were locked and can only be seen from outside. The Museum has a good collection of historical Danish artifacts, as well as local artifacts incl coins, pottery, documents etc. On the other side of Neemrana, is the Masilamaninathar temple aka Manivanneswaram! The original temple was built by Maravarman Kulasekara Pandiyan in 1305 CE. It was so much pain to even look at it! The original temple was very much on the beach itself! Centuries ago, when the Danish visited here, it was much away from the sea, but with rising sea levels, currently it is on the edge of the sea! During Tsunami, the temple’s Vimanam (tower) broke and fell into the sea. The Govt had set aside funds for its renovation. However instead of restoring this temple with its ancient charm, currently a new, modern temple has been built next to it, complete with tiles! So I’m just refraining from writing anything more about it! Just beside Neemrana (which was originally Collector’s Bungalow), is the Governer’s Bungalow. Today it has been restored but is not being used as anything and is under lock and key. The keys are with Dansborg and can be seen with special permission. Besides this is the Commander’s House which is now being used as the Maritime Museum. Under the Danish, the whole of Tranquebar had a fortification wall! Today the Gateway built in 1792 (renovated in 2002) still survives but the wall is completely gone. I went in search of the bastions marked in the map of INTACH. I managed to find the base of one of the three behind the cemetery in the midst of several outgrowths!!! I’m still not sure if what I found was actually a bastion or not!!! The post office here also been there since Danish times though the building has been rebuilt over and over! Why this tiny little town is very important, both nationally and internationally is because this has the first ever Protestant Church of India! When the Danish came here, the King also wanted to bring in their Christian missionaries. However the Danish missionaries, showed a lack of interest in moving to India. So he sent Bartholomäus Ziegenbalg and Heinrich Plütschau from Germany who reached here on 1706. There is a plaque planted here in 1906 at the beach marking their landing site very close to the entrance of the hotel. More about Zeigenbalg, Christianity and more Danish Architecture coming up soon. Stay tuned. All are walkable from Bungalow and the Beach, Neemrana Hotels. Refer to my earlier post to reach the hotel. Here’s the INTACH Map of all the important buildings of Tranquebar. Your pictures are amazing! What a rich history. How cool that such a small, not very well-known place has the first Protestant Church in India. Looking forward to reading more about this! It's a sad history for India, but you make the Dutch influence look interesting. I love the bright yellow of Masilamaninathar temple- it's so charming. How devastating that the sea level has already risen so much. I didn't know any of this! It sounds like such an interesting place with the Danish history instead of English like much of India. I haven't been to India yet but I'd love to go and it's so nice to discover new places like this to add to the list! I was aware of the history of British colonization, but didn't know about any French, Portuguese, or Danish influence in India. It is an interesting history that you have brought to life. As a history buff, the fort would be a very interesting place to visit. It's interesting to read about other colonization in India other than the British. I must confess I was aware of the Portuguese in Goa and French in Pondicherry but not the Danish. I didn't know borg was fort in Danish either, the Danish fort Dansborg is very Instagrammable! I wouldn't have imagined a protestant church in India but now I know where the first one was built! I did not know that India has a history of Dutch colonization but I learned a lot after reading your post. I am familiar with the British involvement in India. It is nice to see the Dutch influences on your photos. It certainly looks different from other regions in India. Quaint little seaside town to spend a few quiet days and contemplate on the linkages with the past. Did you stay at the Neemrana place by the beach? I love reading about the history of places and how like in India, things have Dutch names! Never been to India, but it seems so vast and diverse! I love how you captured the local lady aswell as the local scenery. Looks a lovely place to visit. I am going to India later in the year can not wait if this is the sort of thing I am going to see. I hadn't ever heard of this place. Love your local explorations in Tamil Nadu. Just so enriching to read and learn. I didnt know about the Danish rule. These hidden gems never get noticed. Thanks so much for documenting it. The water is so blue!! I knew about Indias colonial past. It really is quite sad. These pictures look awesome! First off...this place is beautiful. I know of British colonization in India but not much about the Dutch. As a minority, I fully understand dealing with painful past histories of your home country. Thank you so much for introducing Tranquebar to me! I knew that Dutch did have a small influence in India. This was nice revival of the history and the days gone by. Would love to see those Danish artifacts left behind. I really like that shot of the woman sitting there, it's beautifully captured. Well done! Nice article overall. I feel sad whenever I read the tragic history of India suppressed by foreign invaders. India has suffered a lot during the British rule! But glad to see that it is developing now! Looking forward to the glimpse of more Danish architectures in your new posts! What a pity that the Masilamaninathar temple has fallen down because of a tsunami. I would like to be able to go back in the time to be able to visit it. Its great to see a post like this! knowing our past is good. I am currently visiting Srerampore, Chandannagar to see the signs of Danish and Fresh colonisation in India. Wow! 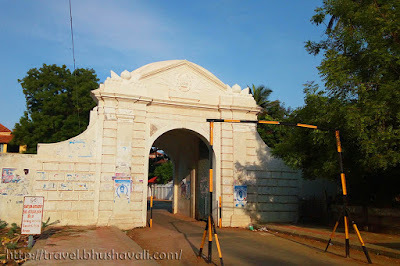 People usually keep talking about Pondicherry and its French architecture, but Tranquebar is an unknown gem. The pictures are fantastic and so is the blog. Never been to India but looking forward to going there to learn about the modern culture but also to see what effect the British had on the country. Great write up about which countries had which parts of India, some to which I didn't know. I do so love your posts as I always learn so much from them! I wish I had already travelled to this part of the world, I'm desperate to soak up the history and culture. Historical towns are always high on our list of must-visit places. That ancient boat looks really interesting. I feel you about the government's so-called "restoration" efforts. That also happens here in the Philippines. I just knew about the British influence in India and Portugal colonization in Goa. The Danish and French are really new to me. The fort really looks interesting. And it is really sad to see the devastation happening to the temple because of the rising sea level. Your pictures are beautiful and amazing post. I didn't know that Denmark had colonies in India. To find out something new in history of India is exciting. I love to visit historical towns. Thanks for sharing.